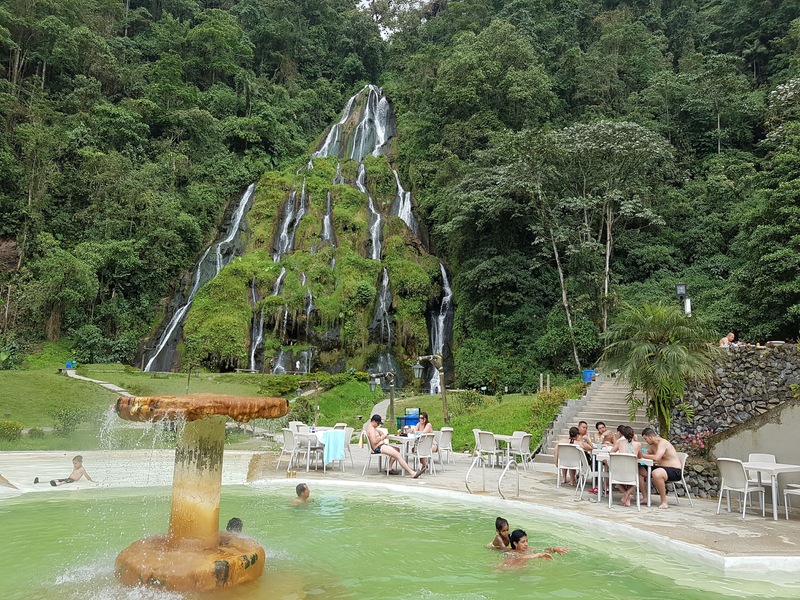 “What a mission!”, I thought as I sat on yet another bus, taking me further away from Salento, Colombia, the picturesque and very touristic town set high up in the Zona Cafetera, and closer to my destination, the thermal baths in Santa Rosa de Cabal. I had foolishly thought that my journey today would be straightforward, and was irked that it wasn’t going that way. To be fair, my rather lackadaisical approach to travel planning doesn’t help my cause, and anyhow, I usually get to my desired destination, albeit with the occasional sprinkling of drama! I awoke in my dorm room, top bunk, drinking in the stark cleanliness of my sole occupation. What a contrast to my arrival 2 nights ago: all six bunks occupied, bags and associated contents strewn everywhere with little care. The Irish girls had left last night and it was clear that the French Canadian girl and German guy had got up earlier this morning amidst my slumber: oh earplugs, my trusty travelling twins, I salute you! It was about to turn 8. I tackled my fairly typical Colombian breakfast of eggs, bread, bland cheese, mixed fruit and coffee outside on the terrace, admiring the spectacular verdant panorama around me. As I did this, it struck me that although this wasn’t my favourite hostel in Salento, it wasn’t all that bad, given a nights stay including breakfast set me back 8 pounds. Suitably fuelled, having observed the all too familiar ritual of reconstituting my life into 35 litres of backpack, I bid farewell to the hostel staff and headed to the bus stop. I had engaged in a quick, stilted conversation in Spanish before I left, trying to understand when the next bus to Pareira, my first stop towards the thermal baths, would leave. Their information board rather worrying seemed to indicate the next one would be at 11am which countered my assumption of a frequent service! I reached the bus stop, which was really a bus office/shop with a confusion of travellers and luggage waiting to leave in various directions. I shuffled past various people apologetically, and peered into the shop: no-one was there. I waited expectantly and went in, as if the act of entering the office would miraculously manifest some staff: it didn’t. I asked around: I was none the wiser about Peirera. A bus arrived for Medellin, but that was little help to me. There was nothing for it: time to grab another coffee at the panaderia (bakery) round the corner. Colombians love their pastries and they are everywhere to be seen, simple places selling cheap coffee: tinto (not the premium coffee, which gets mostly exported to Gingros – although this is changing) and a whole variety of pastries: croissants, sweet pastries with arequipe (the ubiquitous milk jam / dulce de leche, often flavoured with fruits such as guava), savoury pastries and empanadas (corn based semi-circular pastries: typically corn-based and fried in Colombia, and containing meat and potatoes). This panaderia was full of laughter, the staff ribbing and joking with the locals. They gave me a big hearty, loving welcome as I have come to expect all over the country. There was an old man proudly displaying his old ID cards: two snapshots of the same man, many years ago. As was exclaimed often by the others, it turned out he was 78 years young, as he grinned from ear to ear! He was diminutive, looked fit, healthy and happy for his age, as he motioned his walking stick towards the boys making fun of him in cheeky, mock admonishment! I thought about how wonderful it is to get older in this way, rather than to go the other way and become curmudgeonly. It’s a pity my Spanish skills were lacking and so couldn’t understand everything going on. I returned to the stop: the news was better. 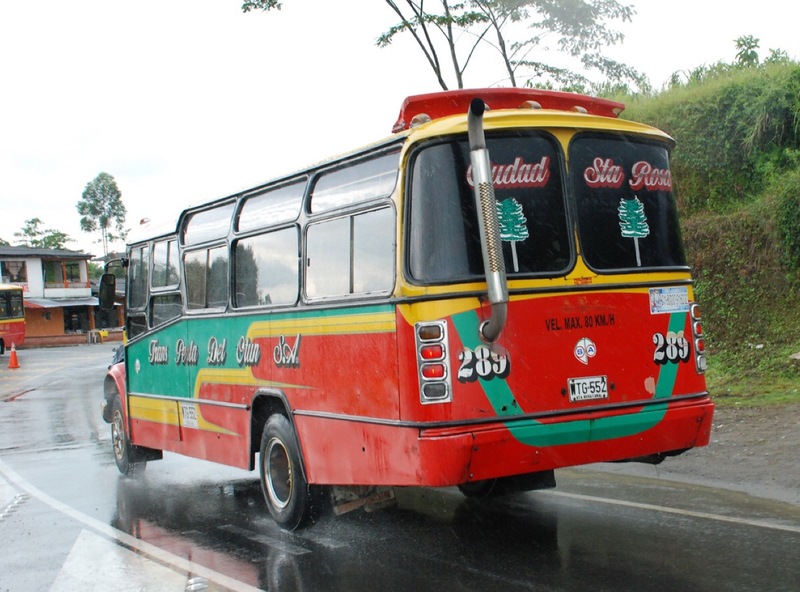 The word on the street was that a Pereira bound bus would appear around 10 am mas o minos. Whilst waiting I observed a girl who had two backpacks adorning her: one huge one at the back, and lo and behold, the twin of my backpack attached to her front. She was very impressed that I was essentially wandering around with her daypack for 2 months. Well, what do you know, the bus arrived pretty much on time and in an hour I arrived at Pereira bus station, which was pretty big. I managed to find my bus for Santa Rosa de Cabal pretty quickly and in another hour or so, I was dispatched at a street corner in the town, where I was assured I could catch my final bus, bound for las termales. This, dear readers, takes us back to the beginning, on the bus heading towards the thermal baths, where I was getting more and more annoyed by the minute. Sat opposite me in the bus were a couple of mothers with their respective progeny, both little boys. The one nearest to me was very cute, and clearly at that age where it is appropriate to question and comment on everything. Throughout the journey he continued to exclaim, point and excitedly shout at his mother about everything (of course I didn’t understand much apart from the odd sentence). After a while, this irked boy from London started to calm down and relax. As I entered a meditative state with the excitable boy’s exclamations relegated to the background, I had an epiphany. The little boy reminded me of myself when I was of a similar age! It was of course, ahem, a few years ago now (one or two), and it wasn’t in Colombia, but in East London. On a very rare occasion, my mother would take me via the London Underground to Bromley-by-Bow in order to meet my father after work, I think. This trip was, undoubtedly the most amazingly, fantastically, superbly, mind-blowingly exciting thing ever to have happened ever in the whole, wide universe across all four dimensions (or 13 if you believe String theorists)! Despite the passage of time, this memory is still very strong. You know, this changed my entire outlook. Actually, the day had actually gone pretty smoothly, with hardly any waiting at stops. Acknowledging that the journey was as important as the destination in terms of my happiness and in terms of its value, rather than thinking about the journey simply as an arduous inconvenience, changed everything! As it happens, when I got there the thermals were not really much to write home about. This was either an objective evaluation, or perhaps, more realistically, partly due to the fact I was in such a rush to get out of there and back on the road to hit Cali (my final destination of the day where I had accommodation waiting) at a decent hour. Yep, you can take the boy out of London, but to take London out of the boy is not a trivial process! As I bathed in the warm waters of the thermals, I observed the waterfalls in front of me and thought of the flow of the water. Gravity makes the water flow, and the water is unstoppable. I reflected that we talk of flow in our lives, when we are so absorbed in our job or life that hours go by, much gets done and it seems effortless, without impediment, much like the water roaring against the rocks. As gravity drives the flow of water, our passion drives our own flow. Looking back I loved the journey from bus to bus, sharing moments with fellow passengers, the hypnotic undulation of the bouncy suspension, looking out the window and seeing the minutiae, the rough edges, all of life passing by my window. In life’s journey we need to ensure we are taken to new places of our choosing. We need to acknowledge that journey, to bathe in the flow that lights us up, and not focus overly, certainly not exclusively on our destination! 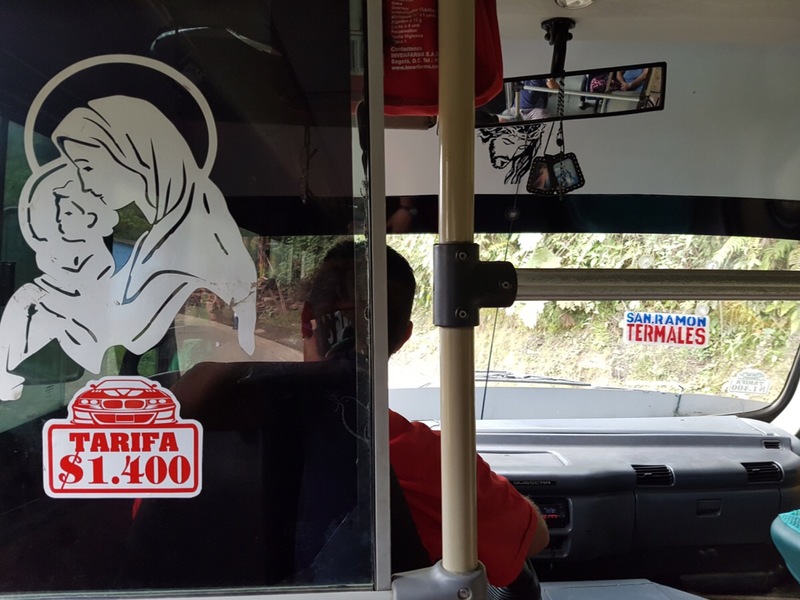 On the way back from Santa de Rosa Cabal I waited for a bus back to Pereira. Next to me was one of the ubiquitous fruit vendors. They have fruits in various combinations in plastic cups: single fruits like mango and watermelon, as well as strips of mango biche (raw mango), and mixed fruits too. The mixed fruit looked particularly inviting so I grabbed one. It was a delicious combination of mango pineapple, guayaba manzana (Apple guava – they have two types of guava in Colombia, the normal one, guayaba pera, which is pink inside and the one which is more tart and white inside, guayaba manzana, which you can find in Asia too), coconut, seasoned with salt and lemon. Here’s a picture of my beloved guayaba manzana. 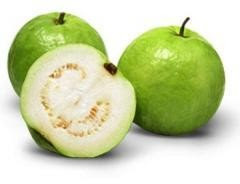 It’s such a pity that you cannot find good guavas in this country: we do get the white ones, but they are useless and overzealously seeded. If anyone knows differently, then please, do let me know! Salt and lemon with fruits. How odd you say? No, not at all. This combination is popular around the world: think of Thai flavours in their salads, and in the chaats of India. Of course the Thais and Indians decide to take the this culinary idea and magnify it into a veritable explosion of contrasting flavours! A cop out you might say, but this Colombian travel/food post will now finish off with a recipe for fruit chaat, similar to that which can be found on the streets of Delhi: I promise a Colombian recipe later. This is a very rough and ready recipe, and you have free reign to mess around with this: use whatever fruit you have. In terms of spicing, stick to the Colombian combination of salt and lemon if you want, or spice it up more if you feel so inclined and have the ingredients at hand. Chaat Masala is a ready bought spice mix which many Indians have to hand to make our many chaats. The word Chaat means to lick in Hindi, and these delicious snacks are so tasty you really do want to keep on licking! Chaat masala contains amchoor, dried mango powder, which gives it a sour flavour, as well as kala namak, a rock salt containing other, primarily sulphur based compounds. Cut all the fruit and potato into small cubes. Put all the fruit into a bowl and mix in all the spices. lemon juice, and tamarind, if using. Take the cubed potatoes, and shallow fry them in oil until they are nice and crispy on the outside. Release them onto kitchen towel to remove the oil and mix them into the fruit chaat mix. As soon as you have added the potato, eat immediately to enjoy the contrast of the crispy potato with the fruit, and the explosion of flavours!